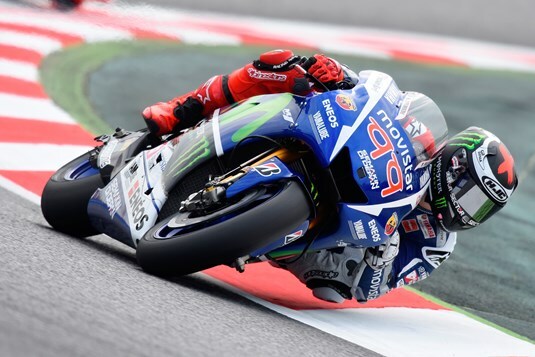 Today Movistar Yamaha MotoGP’s Jorge Lorenzo and Valentino Rossi concluded the first free practice sessions in seventh and eleventh place respectively in the combined session times, as they prepare for another sizzling battle at Circuit de Barcelona-Catalunya. After a short break, Movistar Yamaha MotoGP riders Jorge Lorenzo and Valentino Rossi were back on tarmac today for the first free practice sessions ahead of this weekend’s GP Monster Energy de Catalunya. Enjoying the support of his home fans, Lorenzo consistently upped his pace in FP1. Despite difficult track conditions due to the heat, he was quick to set a second fastest time with a 1’42.458 lap. The local hero spent the remaining time of the session concentrating on perfecting his setting and ended the morning in fourth place. The track conditions improved slightly in the afternoon. More comfortable aboard his YZR-M1, Lorenzo posted a fastest time of a 1’42,034. This hot lap pushed him up to provisional second place in the time sheets, before the pace quickened in the final stages, moving him down to seventh. Rossi also enjoyed the first outing in Montmeló. After quickly re-familiarising himself with the track he set the second fastest time on his first flying lap. Focused on the task at hand he bettered his time to a 1’42.938 as the pace quickened, wrapping up the first session in eighth position. The Doctor had a similar approach in the afternoon. He wasted no time to shoot up to the second spot and used the remaining minutes on the clock to work towards a solid race set-up until the time attack in the final stages of the session. He dropped a 1’42.367, moving him briefly up to third in the time sheets,and finished FP2 in eleventh place. The results put Lorenzo in seventh in today’s combined times, 0.876s from first, and Rossi in eleventh, 1.209s from the front. Monster Yamaha Tech3 rider Pol Espargaro kick-started his home campaign in front of his passionate crowd by completing the opening day in 9th position in the combined standings. The 24 year old rider started his weekend by making the initial steps in setting up his Yamaha YZR-M1 for Sunday’s 25 lap sprint as he concluded the practice in 14th place. In FP2 the temperature increased and Espargaro continued his work whilst aiming to improve the setup of his bike. After undertaking 20 laps around the 4.7 kilometre circuit, he finished with a best time of 1’42.313 in the tightly contested opening day of action. Tomorrow he will intend to clinch a top grid position in the all-important qualifying session, for round 7 of the 2015 MotoGP World Championship in front of the ever-ecstatic Catalan crowd. Meanwhile, Bradley Smith concluded the opening shake down at the Catalan Grand Prix in 14th position in the combined standings. The young British rider began the day by making the first alterations to his MotoGP bike with the Monster Yamaha Tech3 Team and finished FP1 in 15th place. As soon as free practice 2 began, Smith got straight to work and continued his relentless efforts in getting prepared for the 25 lap battle on Sunday, whilst completing a total of 21 laps around the circuit. This was the highest number reached in the MotoGP field and the young rider met the chequered flag in 13th with a best lap of 1’42.645. He now aims to make additional adjustments for his race setup tomorrow in preparation for the Monster Energy sponsored Catalunya Grand Prix on Sunday. The Athinà Forward Racing team was on track today to practice the Catalan circuit where the Grand Prix of Catalunya will take place this Sunday. Stefan Bradl and Loris Baz went on track to try new solutions on the front that might improve their race pace. This weekend the two riders will be fighting again for the lead in the Open class. After showing a good speed in the morning, Bradl could not find the right feeling with the bike on the corner entrance and he was not able to progress in the afternoon. His best lap time was 1’43.536 which earned him the 22nd position. Teammate Baz found a good solution for the front in the second practice session. He managed to post a solid 1’42.968 which earned him the 16th place.